Despite being an integral part of Intel's product stack, reviews of the lower power models are few and far between. For those of us that have no interest in overclocking, the lower power parts can offer similar stock performance to the big boys but at 65W and 35W. Today we are testing three chips available from Newegg at $135, $215 and $315. Simply put, T is used for 35W/45W models and S is for 65W models. The S models tend to have similar single core performance to their normal cousins, but reach 65W by reducing the multicore frequency when the CPU is loaded. The T models reduce both single core and multicore frequency to hit their 35W or 45W, but tend to be a little more esoteric in their position in the stack. In general there are two ways to reduce the TDP on a CPU. We can either reduce frequency (easy) or reduce voltage (difficult). Reducing the voltage results in more of a change in power consumption, but the best way to tackle this is when Intel performs its binning process. When a manufacturer creates a wafer of CPUs, these have to be tested for accuracy of calculations, functions, and the voltage/frequency response. It is this latter characteristic which matters most when determining what product in the stack it should be. The units with the highest frequency for the lowest voltage (on a scale) tend to be reserved for the fastest processors or Xeons. Note that it is not only a single data point being tested, but a whole scale from low frequency to high frequency. The unit has to match an entire line to be sufficient for that designation. Where the low power CPUs come in is that they follow a particular line at a potentially lower voltage range than expected. There have been reports of the regular branding of CPUs being reduced in frequency and matching the stability of the S/T processors. That is entirely possible, as a unit can be a member of many bins at the same time. At the end of the day, when you purchase a lower power processor, you are essentially guaranteed that level of performance and TDP by the processor manufacturer. To represent Intel's Haswell line-up, I want single out where the S and T processors stack up against their normal counterparts. Thus is made somewhat difficult by the Haswell refresh earlier this year which caused a frequency bump in most models, but both pre-refresh and post-refresh processors are still up for sale in most markets. If we do direct comparison with a few of the S processors with their non-S counterparts, we see their main difference is just the multicore frequency to drive the TDP down. 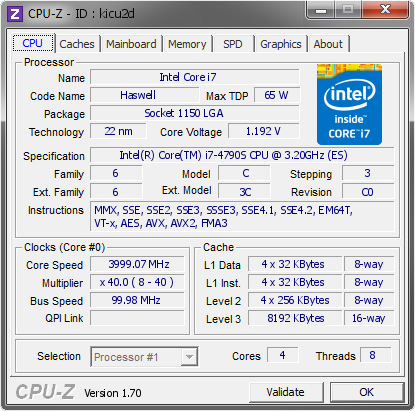 With the T processors, we see a more aggressive trend especially with the i7 range. The i7 35W processors have always been a fascination of mine (much like the 65W 12-core Xeon we reviewed earlier in the year). Ultimately these are best for work flow that can use multicore processing but the code has significant memory delays. This reduces the idle time per core and uses less power. The purpose of this review is to see how these processors compare to those we have already tested. We currently have a good spread of the Haswell range, and all the results can be found in our online benchmark comparison database, Bench. Power consumption was tested on the system while in a single MSI GTX 770 Lightning GPU configuration with a wall meter connected to the OCZ 1250W power supply. This power supply is Gold rated, and as I am in the UK on a 230-240 V supply, leads to ~75% efficiency > 50W, and 90%+ efficiency at 250W, suitable for both idle and multi-GPU loading. This method of power reading allows us to compare the power management of the UEFI and the board to supply components with power under load, and includes typical PSU losses due to efficiency. 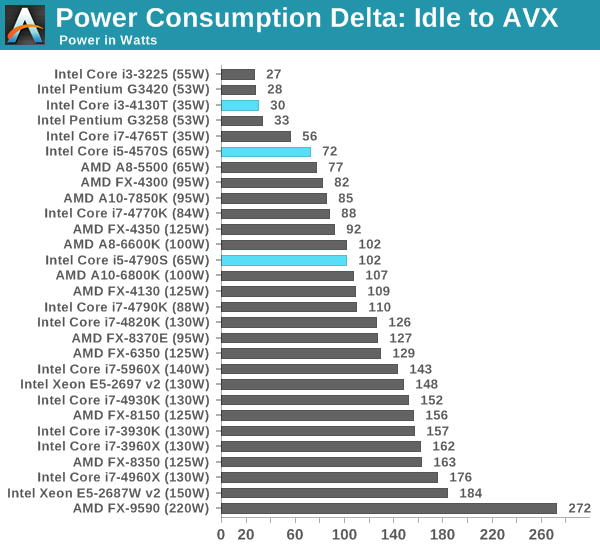 Power consumption for our i3 and i5 samples were near on the mark, whereas the i7-4790S scored 102W from idle to AVX. This is more than the i7-4770K, which might come across as a bit alarming. We also have some full system power draw numbers from the MSI B85M ECO review, while using a Rosewill Silent Night 500W Platinum power supply. These are still in the 5% power used range for the unit, so efficiency is still around 70-80%. At request from some of our readers on Twitter, we also measured the temperature delta from idle to load on the stock Intel cooler. 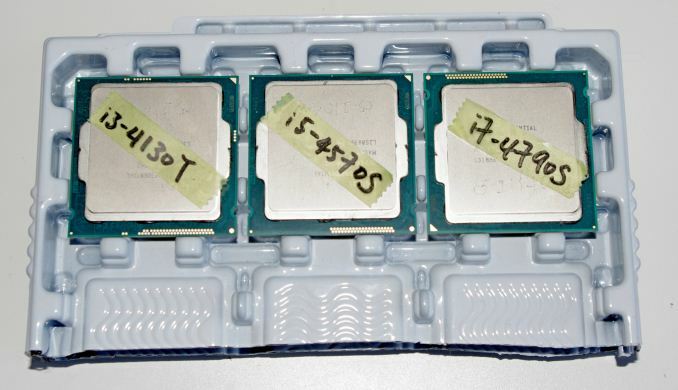 So you think these CPUs really are better binned? An undervolted K series cannot always pull off the voltages at the same clocks as a S series? We constantly hear about how aggressively Intel bins parts, how each model is a special snowflake that's exactly optimized for its role, etc etc. I've yet to see any evidence that this is actually true (as opposed to "Intel engages in very aggressive market segmentation --- by product name". The primary reason I'm not convinced is that no-one else bins nearly as aggressively. Apple, never a company to miss the opportunity for a dollar, doesn't engage in some obvious binning (eg ship the iPhone6+ at 100MHz faster; or even give you a 100MHz speed boost in each model as you go from 16GB to 32GB to 64GB storage). Qualcomm offers a fairly limited palette of Snapdragon speeds. Samsung, the master if there ever was one, at slicing and dicing phone models, doesn't offer the same phone at speeds of 1, 1.5, and 2GHz; etc etc. Almost nobody pays attention to GHz numbers in mobile devices. Nobody really cares. And the scaling with ARM really means nothing. Apple consistently has among the highest performance ARM CPU's yet they're lower clocked and lower core count than everyone else. Binning ARM CPU's would require two things in order to be profitable: real-world benefits to a slightly higher clock speed, and marketing the higher clock speed as worth the premium. Currently there are neither. I'd guess 99/100 people don't even know the clock speed of the phone they own, because that's how irrelevant it is. For many applications (such as gaming, where performance is not consistent across the majority of devices) the GPU matters more than the CPU because of how heavily optimized these apps are for the GPU. The PC landscape is totally different.. You still have PC's sold that have 1/10th the performance of a Core i7. So Intel chips can't be overclocked and produce more watts than different lettered processors under identical conditions? That isn't what was tested and would be a rather shocking development.